Shrutilaya & Abhinaya, Bharatanatyam Dancer, Tamil Nadu, India - Sabhash! Shrutilaya & Abhinaya are senior disciples of Smt. Roja Kannan who is a renowned Bharathanatyam exponent and belong to the Kalakshetra style or bhaani of dancing. They completed their Arangetram 5 years ago and have been giving performances in the December/Margazhi Music & Dance Festivals successively in the last 5 years. Both are from the Padma Seshadri Bala Bhavan School known for promoting talent in Indian Culture & Fine Arts. They have represented PSBB successfully in dance competitions several times. Shrutilaya is pursuing her B.E. in Anna University. Abhinaya (now 15 yrs old) is a class XI student of Padma Seshadri Bala Bhavan School, Nungambakkam, Chennai. They have performed for leading sabhas of Chennai including Narada Gana Sabha, Nungambakkam Cultural Academy, Brahma Gana Sabha, Mudhra, Bharat Kalachar, Thyaga Brahma Gana Sabha (Vani Mahal), Vipanchee, etc. Both of them have participated successfully in the Jaya TV ‘Tha Ka Dimi Tha’ competition. Abhinaya was also successful in the Doordarshan ‘Konjum Salangai’ competition anchored by Ms. Vennira Aadai Nirmala. With their Guru, Smt Roja Kannan, they danced for TTD at Tirumala which was telecast live in August, 2011. 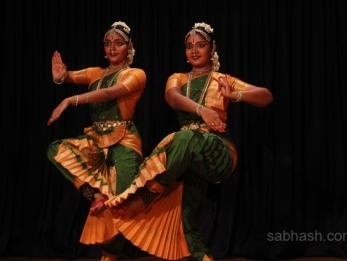 Besides Chennai, Shrutilaya & Abhinaya have performed at the Chidambaram Natyanjali Festival. Also, they have given group/individual performances at Pondicherry, Vellore, Thirukadaiyur, Panruti, Kalavai, etc. in Tamil Nadu. Besides their solo/duel performances, they have also been part of many group programmes/dance ballets conducted by their Guru Smt. Roja Kannan. This includes the Ardhanareeshwarar Kuravanji staged more than 15 times already in Chennai which has also been brought out as Moser Baer CD/DVD. Abhinaya has the distinction of dancing in the famous Cleveland Thyagaraja Utsavam in USA in 2008. She has also given dance recitals in New York & New Jersey, USA. Abhinaya was part of the 1000+ dancers who performed at the Tanjore Big temple ‘Raja Rajeswaram 1000’ Programme with Dr. Padma Subrahmanyam. given by CCRT, Ministry of Culture for a period of six years from the age of 14 years. Both Shrutilaya & Abhinaya have received this award for their proficiency in Bharathanatyam.